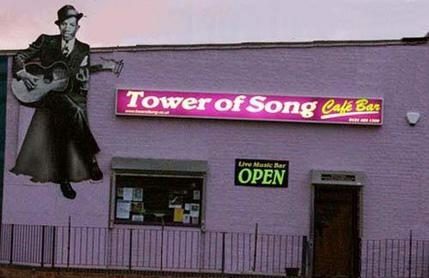 The thriving music venue that is now the Tower of Song began as a derelict building on the outskirts of Birmingham, England. Bucking the trend of theme pubs, sports bars, and karaoke joints where music is an afterthought, Tom Martin set out to create a unique venue where music was the sole focus. The name, derived from a song by Leonard Cohen, reflects the mission of the venue, which is to preserve the integrity of live music, respect the performing artist, and offer the audience an opportunity to experience live music in an intimate, quality setting. Many volunteers helped in the construction of the Tower of Song, inspired by the vision to come together as a community and create something unique. Local artist Mike Browning painted a series of murals on the walls, featuring seminal musicians, singers and songwriters such as Bob Dylan, Janice Joplin, The Beatles, Bob Marley, and the latest – Tom Martin and his band. Mike Browning also created a major work of art outside the building – a distinctive ‘cutout’of legendary Mississippi bluesman Robert Johnson.